Acquired by the United States from Spain in 1898, Puerto Rico has a peculiar status among Latin American and Caribbean countries. In the excerpt below, author Jorge Duany provides the necessary background for understanding the inner workings of the Commonwealth government and the island’s relationship to the United States. How did Puerto Rico become a US Commonwealth? In 1950, the US Congress passed, and President Harry S. Truman signed, Public Law 600, authorizing a convention to draft a constitution and establish a republican form of government in Puerto Rico. In a referendum held on 3 March 1952, 81.9 percent of the Island’s electorate ratified the Commonwealth or Free Associated State (Estado Libre Asociado, in Spanish). The US Congress approved the constitution (after requiring several changes, especially in its bill of rights) on 3 July of that same year; Puerto Rico’s Constitutional Convention approved it seven days later, and the new Commonwealth status was proclaimed on 25 July 1952. The next year, the United Nations removed Puerto Rico from its list of non- self- governing territories. Officially, the Island was no longer considered a US colony. The brainchild of Luis Muñoz Marín and the Popular Democratic Party (PDP), Commonwealth was originally supposed to be a transitory, intermediate status between full independence and annexation as a state of the American union. Under this arrangement, the Island’s electorate selects its own government, and its representatives pass its own laws. Puerto Rico’s elected governor appoints all cabinet officials and other key members of the executive branch; the insular legislature determines the government’s budget; and the judicial system amends its civil and criminal code, without federal interference—as long as such measures do not contradict the US Constitution, laws, and regulations. Commonwealth status represented a greater degree of political autonomy for Puerto Rico in local matters, such as elections, taxation, economic development, education, health, housing, culture, and language. However, the US federal government remained in control of most state affairs, including citizenship, immigration, customs, defense, currency, transportation, communications, foreign trade, and diplomacy. To what extent did Commonwealth status recognize the sovereignty of the Puerto Rican people? The Commonwealth formula did not substantially alter the Island’s legal, political, and economic dependence on the United States. All of the regulations and articles of the federal laws that ruled relations between Puerto Rico and the United States since the 1898 Treaty of Paris remained intact. Such laws and regulations still apply to the people of Puerto Rico without their consent or control. The subordinate citizenship status of Puerto Ricans continued under Commonwealth as well. Other basic elements of US-Puerto Rico relations established before 1952 include the adoption of the US dollar as the Island’s currency, US customs control, US citizenship, federal labor legislation, welfare benefits, and an elected governor. Under Commonwealth status, Puerto Rico continued to be an “unincorporated territory” that “belonged to but was not a part of the United States.” The US Congress and president could unilaterally dictate policy relating to defense, international relations, foreign trade, and investment. Congress could also revoke any insular law inconsistent with the US Constitution. Moreover, Congress or the president could apply federal regulations selectively to Puerto Rico, resulting in both concessions and revocations of special privileges. In addition, many US constitutional provisions—such as the requirement of indictment by grand jury, trial by jury in common law cases, and the right to confrontation of witnesses—were not extended to the Commonwealth. US authorities and Commonwealth sympathizers have long argued that the Puerto Rican people exercised their right to self-determination. According to Commonwealth advocates, Puerto Rico entered into a solemn “compact among equals” with the United States in 1952. US authorities and Commonwealth sympathizers have long argued that the Puerto Rican people exercised their right to self-determination. Commonwealth advocates believe that this formula can be renegotiated to correct its flaws and attain greater autonomy. However, the nature of the “compact” between Puerto Rico and the United States has been disputed from its inception. Pro-statehood and pro-independence critics contend that Commonwealth is a colonial status because of the lack of effective representation and unrestricted congressional and executive power over Puerto Rico. In recent years, the US federal government has increasingly weakened the Commonwealth’s fiscal autonomy, in the wake of financial crisis. Hence, both the political and economic bases of the Estado Libre Asociado have wavered. In what sense is Puerto Rico a nation? Puerto Rico meets most of the objective and subjective criteria of conventional views of the nation—among them a shared territory, language, and history, except for sovereignty. The Island possesses many of the symbolic attributes of modern nations, including a national flag and anthem; national heroes and rituals; a national system of universities, museums, and other cultural institutions; a well-developed national tradition in literature and the visual arts; and national representation in international sports and beauty contests. For decades, the Island’s intellectual elite has striven to define a national identity based on defending the Spanish language, the Hispanic heritage, and other popular customs. 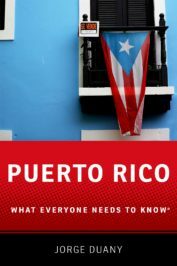 Most important, the vast majority of Puerto Ricans imagine themselves as distinct from Americans as well as from other Latin American and Caribbean peoples. In a 2002 poll, 60 percent of those interviewed on the Island identified Puerto Rico as their nation; about 17 percent considered both Puerto Rico and the United States to be their nation; and only 20 percent chose the United States alone. However, most of the Island’s electorate does not currently support the creation of a sovereign state in Puerto Rico. Rather, Puerto Rican voters have reiterated an overwhelming preference for US citizenship and permanent union with the United States. A key issue is the freedom to travel to the United States under any political status option. Under the Commonwealth, Puerto Ricans have unrestricted entry into the US mainland. They would retain that right under statehood but probably lose it after independence. Featured image credit: “Flags” by MariamS. CC0 Public Domain via Pixabay. Jorge Duany is the Director of the Cuban Research Institute and Professor of Anthropology at Florida International University. He has published extensively on migration, ethnicity, race, nationalism, and transnationalism in the Hispanic Caribbean and the United States. He is the author, coauthor, or editor of 20 books, including several works about Puerto Rico. Thank you for this explication of P.R.’s status. I am now that much better informed. Seems to this humble reader that U.S.A. ought to be helping P.R. more earnestly and assiduously in the island’s current distress. It seems to me that wealthy corporations utilize Peurto Rico as a safe heaven for tax purposes. Puerto Rico it self is mired in corruption and low wages. So why are we continuesoly bailing them out with financial aid and from what I have seen a inordinate number of their citizens commit crimes in the US then bail back to PR to avoid being charged.